Houston Texans wide receiver Andre Johnson hosted a holiday shopping spree at a Houston Toys “R” Us allowing 12 children selected by Child Protective Services 80 seconds to stuff as much as they could into a shopping cart. 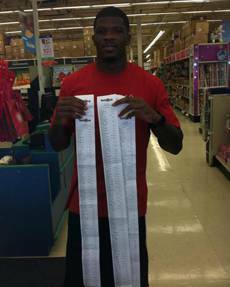 The final total of the shopping spree was a mile-long receipt for $19,521, paid for by Johnson and the Andre Johnson Charitable Foundation. All 12 of the children who participated Tuesday had been exposed to parental abuse in one form or another and live with someone other than their parents. Johnson, a Miami native who does charitable work in his hometown as well, empathizes with children who have tough backgrounds.